Last season looked like it was going to be a bit of a rebuilding year for Arizona. Aubrey Peacock and Sarah Denninghoff transferred, while NCAA scorers Emma Darlington and Alyssa Anderson had finished out their four years. Despite those losses, though, the Wildcats managed a fifth place finish at NCAA’s, thanks to a superb effort from Margo Geer, who came away with NCAA titles in the 50 and 100 freestyle. Geer also turned in some of the top relay splits in the country, keeping all five relays she was a part of in title contention (they all finished second or third). She stepped up her game further this summer, recording her best time in the 100 freestyle and matching her career best in the 50. Geer was joined on those relays by a four seniors who also scored individually. Megan Lafferty swam on four of those relays, and also scored in three individual events. She earned All-American honors in the 100 fly, and swam critical fly legs on both medleys. Fellow seniors Lauren Smart and Ellyn Baumgardner swam the backstroke and breaststroke portions of those relays, and combined to score in three different events. Monica Drake failed to qualify for NCAA’s individually, but dropped a 47.4 and 1:44.0 to garner second place finishes on the 400 and 800 freestyle relays. The other bright spot in the pool was true freshman Bonnie Brandon, who scored 30 individual points in her first year at Arizona. Brandon finished a surprising fourth in the 500 free, and won the consolation final in the 200 backstroke. 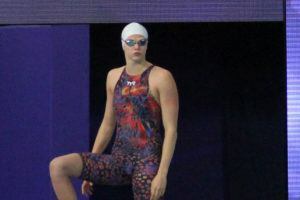 Her contribution extended to the 800 free relay, as well, where she recorded the second fastest leadoff leg in the field (1:44.7). Flash back to March 2011: just one year removed graduating arguably the best senior class in Wildcat history, a group of five true freshmen made a statement at the NCAA Championships in Austin, Texas. Despite losing 18 of their 20 relay swims from their 2010 team, an incredibly young Arizona squad finished fifth at NCAA’s, highlighted by an all-freshmen second place finish in the 200 free relay. With only aging teams in front of them (Cal, Georgia, USC, and Stanford), Arizona looked to be sitting pretty in the future. NCAA All-Americans Sarah Denninghoff (third place finisher at World Championship Trials this summer), Aubrey Peacock, and Olympic Trials finalist Kaitlyn Flederbach are gone. The last two freshmen classes have been under par for coach Eric Hansen. Although Bonnie Brandon is a star, and the development of Emma Schoettmer and Florida transfer Alana Pazevic have been great, nobody else has contributed substantial points, even at Pac 10’s/12’s. Somehow, even with 14 scholarships, the squad is carrying just seventeen swimmers this year. While the Wildcats are returning seven swimmers with NCAA experience, five of them have never scored individually, and only one swimmer (Elizabeth Pepper, a Florida State transfer) is fresh face brought in to replace points or fill any of their eight relay vacancies. Five of Arizona’s top six remaining assets (Geer, Evans, Finnegan, Pazevic, and NCAA champion diver Samantha Pickens) are seniors this year. Arizona has yet to secure a high-level verbal commitment for next year. In the meantime, Stanford has already virtually locked down six of the best recruits in the country, Georgia and Cal have each picked up multiple National Junior Team members, and the other top teams (Texas A&M, USC, Tennessee, Florida and Texas) all have multiple All-American seniors, meaning their programs will likely have a fair amount of equally-enticing scholarship money to give out this fall, as well. The point? Arizona’s 2013-2014 team looks incredibly thin, and the near-term future of the program is questionable at best. Unless Eric Hansen manages to land a top three recruiting class (doubtful, unless they land Simone Manuel and a handful of others), don’t be surprised if next year’s team falls out of the top ten. Despite what looks like a rather grim future at the moment, this year’s Wildcats team still has some talent left, headlined by Margo Geer and Bonnie Brandon. In the upcoming NCAA season, nobody in the country will be expected to do more for their team than Margo Geer. While freshman Olivia Smoliga could make things interesting in the 50 free, the graduation of Georgia’s Megan Romano leaves Geer as the heavy favorite to repeat as champion in the sprint freestyle events. 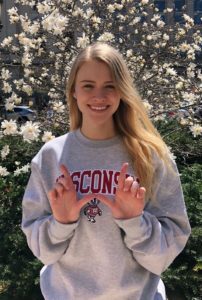 Geer has bettered the next best returning time in the 50 (21.84 by Ivy Martin of Wisconsin) on 10 different occasions in her career, and also holds the top 12 performances in the 100 free (Natalie Hinds of Florda is the next fastest swimmer, at 47.73). Simply put, she’s the best sprinter in college swimming right now. Nobody has successfully defended the 50/100 free double since Kara Lynn Joyce did it in 2005, 2006, and 2007. Geer’s value is doubled by her innate ability to rise to the occasion on relays, capable of splitting under 21 seconds in the 50, mid-46’s in the 100, and 1:43.0 in the 200. Almost nobody in college swimming has ever been that good in one relay swim… Geer has found a way to post all-world times across all five relays each of the last two seasons. 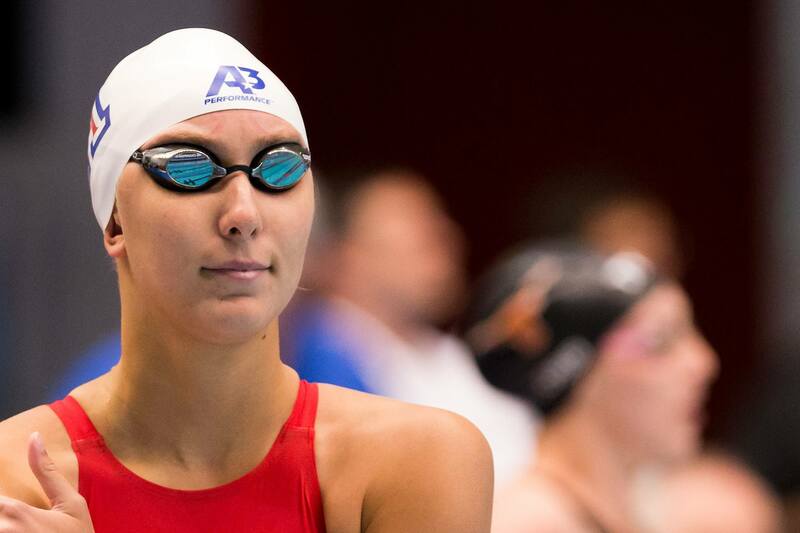 Whereas she has been able to cruise through prelims relays in the past, Geer will be entering the water further back in the pack than she’s used to, meaning she will have to shoulder an even greater load in her final season. Bonnie Brandon made an immediate impact for the Wildcats in her freshman campaign, scoring in all three individual events at NCAA’s, including a surprising fourth place in the 500 freestyle. Brandon also led off Arizona’s second place 800 free relay in a very quick 1:44.79. 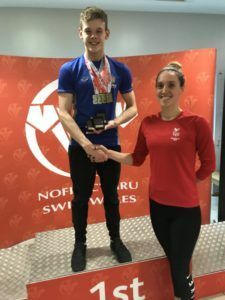 With the graduation of top sprint backstroker Lauren Smart and freestylers Monica Drake and Megan Lafferty, Brandon will forced to take on an expanded role, adding at least two relays (400 free and 400 medley) to her schedule. As we mentioned, this is a team of just 17 swimmers, and after the two women from above, things fall off pretty quickly for Arizona. None of their remaining swimmers have come close to scoring at NCAA’s, and only Alana Pazevic, Elizabeth Pepper, and Grace Finnegan have any relay experience. The biggest holes for the Wildcat lie in the breaststroke and butterfly legs of their medley relay, where they graduated four NCAA scorers in those two events (Ellyn Baumgardner, Chelsey Salli, Lauren Smart, and Megan Lafferty). The Wildcats only have three breaststrokers on their entire roster, but none of them within two seconds of Baumgardner or Salli in the 100, who both made the A-Final last year. Ashley Evans is the top remaining butterflier, but her best of 53.55 is a far cry from Smart and Lafferty, who both broke 52 seconds for Arizona. While there are some glaring weaknesses in the medleys, the freestyle relays look to be at least in decent shape. That being said, they won’t be able to repeat their success from a year ago. They’ll need to replace six quick relay legs from Flederbach, Lafferty, and Monica Drake, but between Pazevic, Brandon, Grace Finnegan (22.6, 49.2 flat start), and Briana Wilford (22.70 flat start), these relays should all finish in the top eight. Pazevic was a solid contributor in her first year with Arizona, anchoring the Wildcat 200 free relay that placed third at the 2013 NCAA’s. She’ll be looking to qualify for the big meet individually this season, as well as potentially jumping on the Wildcat 400 freestyle relay. 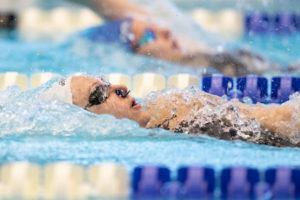 Arizona will count on Finnegan to reclaim her role on the 200 and 400 freestyle relays (she was on both back in 2011), while the pure-sprinter Wilford could also compete for a relay spot. Sunshine State transfers Lauren Neidigh (Florida) and Elizabeth Pepper (Florida State) will provide some much-needed depth in the mid-distance fly, freestyle and IM events. Neidigh holds best times of 4:16 in the 400 IM and 4:48 in the 500 free, instantly adding some stability to the mid-distance group. Pepper, meanwhile, is a two-time NCAA qualifier and FSU school record holder in the 200 fly. She’s a pretty strong freestyler, too; with a lifetime best of 1:47.9 in the 200 free, she could also swim her way onto the 800 free relay to replace the graduated Monica Drake. Arizona has five freshmen on their roster this year, but unfortunately, none of them are NCAA-caliber contributors at this point. Sara Borendame is the top name in the freshman class, but at 1:02.1 in the 100 breast, she has a ways to go before cracking relay lineups. Another bright spot for the Wildcats: the final season of NCAA 1m springboard champion Samantha Pickens. The rising senior also competed at Worlds this summer for Team USA, finishing seventh in 3m synchro and 14th in the individual 1m. Pickens had a disappointing preliminary 3m performance that left her in consoles at NCAA’s last year, but expect her to contend for a top spot there, as well (she was 3rd in 2012). With a thin roster, suspect medley relays, and few returning point scorers, Arizona will be hard-pressed to duplicate their 4th place finish at Pac 12’s and 5th place finish at NCAA’s a year ago. Unless three or four swimmers really step up, Arizona will likely to fall back to 5th at Pac 12’s and 8th or 9th place at NCAA’s. Don’t forget to note the absence of awesome swim managers. The Zona 400 free relay set the American record and not the 800 free….although both of these relays finished second! Regardless, the team came out of nowhere and surprised everyone with a phenomenal performance. The fact that they didn’t break the American Record does not undermine their success. Maybe if so many women haven’t left since the Hansen era, recruiting wouldn’t be so difficult, no matter who the main recruiting coordinator on the women’s side is. I’d imagine that would not be the case, considering any time you have someone in contact with recruits suddenly stop calling, it makes getting large classes very difficult. University of Arizona has possibly the best women’s recruiter in the country in Brandy Collins, but when recruiting gets interrupted like that it is quite difficult to turn it around.